From the womenwhocycle.com perspective it’s great to see women achieving great things in cycling and it’s also great to see a woman reporting on those achievements. Of course, the talented Sophie Smith has not been recruited by SBS Cycling Central to report on just women’s cycling but her mere presence will help raise the profile of women involved in cycling. Sophie’s own interest and knowledge of professional cycling has grown exponentially and it certainly wasn’t her ambition straight out of a Monash Uni to land a job at SBS. After graduating she took her first journalism job at the Geelong Advertiser, known locally as ‘The Addy’. She started with news, then sport and gradually increased her cycling coverage until 12 months out from the World Championships, which were held in October 2010 in Geelong, her editor gave her a weekly cycling page to write and produce . It seemed like an ambitious project at the time and put Sophie on a steep learning curve. Up until then most of her stories had been about local talents Leigh Howard and Cadel Evans, who lived locally so readers wanted to know what they were up to. Her first real taste of pro cycling came in 2009 when she attended the Herald Sun Tour and rode in one of the team cars. From then on she was hooked and started thinking about a journalism career completely dedicated to cycling. Covering the 2010 Tour Down Under further cemented her new found love of pro cycling. During 2010 she covered a few events as a freelancer for RIDE, Cycling Central and the UK’s Cycling Weekly, while still holding down her job at the ‘Addy’ which was pretty challenging. So after the World Championships she received two job offers and decided on the one from SBS. She’s loving the job at SBS. Her first overseas assignment was in Copenhagen this year to cover the World Championships and she’s hoping to travel to Europe again next year. 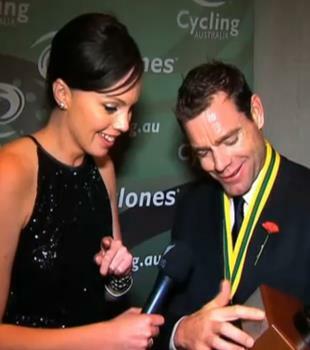 At present she’s also filling in for Mike Tomalaris as host of Cycling Central while he’s on holidays. A long way from the Geelong Advertiser!! While Sophie is enjoying watching, interviewing and bringing us all the highlights of the pro peleton she hasn’t fully embraced the bunch ride cycling culture herself. She describes her bike as a ‘little purple hybrid’ but tells me she’s going to upgrade to a road bike. All I can say Sophie is ‘just do it’. You won’t regret it. The Murray to Moyne will seem much easier on the road bike (the Murray to Moyne is a 520 km relay event that Sophie participated in last year). Sophie believes that the future is bright for Australian women’s cycling with current and up and coming riders like Rochelle Gilmore, Chloe Hosking and Shara Gillow and lots of young women coming through the AIS. Like many people Sophie believes that a great way to raise the profile of women’s racing is to run events before the men’s races, not simultaneously as it occurred in the recent Herald Sun Tour. She also thinks that the women should have an under 23 program as the men do. Otherwise young women are leaping from under 19s into the open ranks . She also agrees that every small step counts. The new Greenedge women’s team which was announced a few days ago will help raise the profile, as will other new teams like the one started by Kristy Scrymgeour of HTC Highroad to be known as Team Specialized Lululemon from 2012. With women like Sophie Smith around to tell us about cycling – both men’s and women’s the future profile of the sport seems assured.